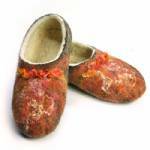 Slippers are thick handcrafted wool felt in various colors. The bottom of the slipper can be left plain or protected with a hand sewn leather sole. A bottom of plain felt will wear through after a year or so of daily use. If the bottom is covered in leather, the slipper will last for years. The leather can be replaced if needed. A tracing around the outside of your foot and two measurements of the circumferance are required before work can start. Please contact me for how to make the tracing and take the measurements. Care: Gently vacuum or brush as needed to remove dirt. Spot clean with water-based cleaner and soft cloth. The slippers shown here are custom, one-of-a-kind projects made for a past clients. Items in this Custom Projects section are for information only; they are not available for regular sale.